Will God Help me not to try Suicide Again? Yes, God will help you as you turn to Him and discover what it means to walk with Him every day. The Bible says, “No good thing does he withhold from those whose walk is blameless” (Psalm 84:11). How does God help us? First, He helps us by giving us the strength to do what is right. When we turn to Christ and ask Him to forgive us and help us, He comes to live within us by His Spirit. We are never alone when we know Christ, for God now dwells within us! He is with us every minute of the day, and He helps us as we turn in faith to Him. His Spirit encourages and helps us when discouragement or temptation comes our way. The Bible says, “The Spirit helps us in our weakness” (Romans 8:26). He also helps us by reminding us that He loves us, and we are His children forever. If you forget everything else I say, I hope you will remember this: God loves you. He knows all about your struggles and failures, but He still loves you–and the proof is that He was willing to send His only Son into the world to die for you. Your life will never be the same once you realize how much God loves you. Don’t face the future alone, or try to meet it only in your own strength. Instead, by a simple prayer of faith ask Christ to come into your life today–and He will. Then turn to Him every day and thank Him for His love and His constant presence with you. Posted in Uncategorized and tagged Billy Graham, Christian, suicide. Bookmark the permalink. The birds, high above in the trees, chirp their welcome. They sing with their various whistles for all the world to hear. An ant crawls across the grass with determination, a rabbit scampers, then stops to look at me quizzically, then hops on. The sounds of natures are all around me and the peace I feel as the cool water ripples around, over, and between the rocks downstream is calming. The smells of nature fills my nostrils. I breathe slowly in and slowly let it out. In times when we have thoughts invade our mind or the worries of life invade causing our peace to skitter away we can take a moment and visualize our safe peaceful place. We all have an image of where we would like to be, a place that fills us with peace. Some may find that peace fills them as they sit by a flowing brook and some may find that peace standing high on a mountain top looking out over a scenic view, while others may find it as they walk a long sandy beach with the sea breeze kissing their cheek, but wherever we find it God will take us there. In times when things seem overwhelming we can stop and take a few minutes and ask the Lord to take us to our peaceful place. He knows where it is. For me I see myself in my mind’s eye sitting under a large tree next to a flowing stream. I hear the birds, I see the rippling water and hear its sounds as it gently meanders downstream to its destination. It’s path has been determined by God and nature and to sit there quietly, with no thoughts, brings peace. Christ said it is His peace He gives us. His peace seeps into my soul and gives me calm. It replaces the worries, it replaces the memories of the past, it fills those spaces that the enemy wants to invade. Sitting quietly, Jesus has arrived. He sits down beside me and we quietly bask in the beauty. My peace is complete. Posted in Uncategorized and tagged Christian, Finding peace, Jesus Christ, peace.. Bookmark the permalink. Victoria (not her real name) is married to a selfish spouse. She prays for him. She encourages him. She seeks ways to serve him. Her husband soaks it up but hasn’t learned to give half as much in return. If I give examples, I may blow her cover, but most of you know marriages like this. Somewhat understandably, Victoria struggles with bitterness. If her husband only knew how much just a small bit of giving back in return would mean, how if for one hour of a weekend he could make it about her instead of about him, the relief she would feel would be enormous, buther husband’s selfishness seems to run through his core. They have talked about it, even with a counselor, but the thing about selfishness is that the more selfish you are, the less you realize it. Her husband thinks he’s doing “better,” but not by much, and usually only when Victoria brings it up, which ushers in a new kind of pain. Victoria’s husband tries to be a little less selfish so that he doesn’t have to listen to his wife complain about it. So he’s fighting his selfishness with, yes, selfishness. Victoria has prayed. She has gone to a counselor. She even brought her husband with her to the counselor—everything advice-oriented people tell her to do. But the situation hasn’t changed much, and doesn’t appear likely to. In that light, she asks me, how do you maintain a godly attitude? Keep in mind—I wasn’t talking to the couple. I was talking to Victoria, and about her spiritualattitude, not resolving the situation (that’s a different discussion). What I’m about to say may make some of you married to selfish spouses angry, but I believe this advice is rooted in spiritual reality. I said this because I didn’t want Victoria to let her husband’s selfishness engender poisonous pride in her own heart. This wasn’t to chastise her, but to protect her on her journey toward God. “Second,” I said, “and here’s the hope—if God is the owner of the store, and we’re just the postal workers, God can use any number of postal workers to deliver what we need. You’re acting like what you need can only come from your spouse, and since he refuses to deliver it, you’re stuck. With some things, that’s true. There are certain things only a spouse can provide. But God can deliver a fulfilling, meaningful life through any number of channels. Fight pride by remembering you’re just the postal delivery person. Everything God gives to your spouse through you comes from God. Your desire to serve, your creativity in serving, your commitment to serve, your conviction to love—that’s God’s work, not your own heart. You are choosing to be faithful in delivering those blessings, but without God, you wouldn’t have the blessings to give, nor likely even the inclination. God can deliver life’s blessings through many channels. We’d all like them to come in a certain way, but wouldn’t it be rather ungrateful of you to complain about a pair of diamond stud earrings if they came in yellow wrapping paper instead of red? Ask God to bring what you legitimately need as He wills, in His timing, and in His way. 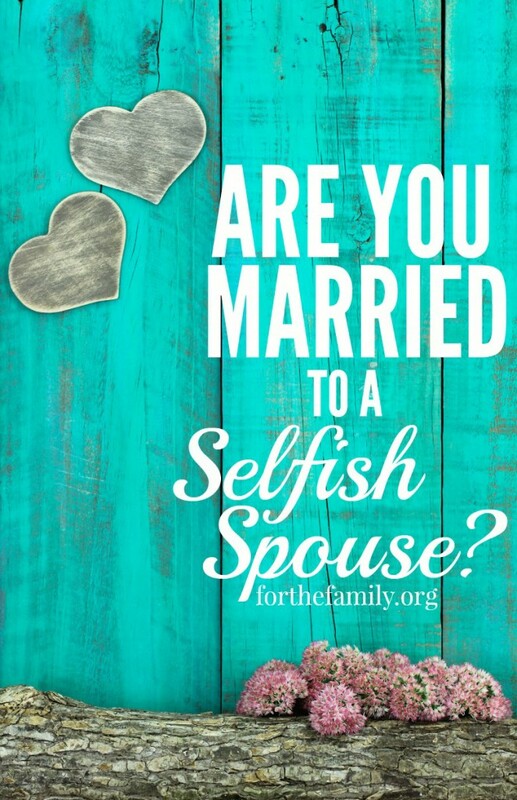 It may not be your ideal, but even in this, your spouse’s selfishness is simply helping you to press deeper into God. That, in itself, is a gift, when you think about it. Don’t stop giving. Don’t allow someone else’s selfishness to infect you. Set the positive example rather than join in the negative one. There’s a certain fulfillment that comes from being faithful when it’s done in the right spirit; seek to capture that. I write this because some of you may live the rest of your lives still married to a selfish spouse, and the last thing I want to see is your spouse’s selfishness affecting your spirit with resentment, bitterness, and eventually your own selfish demands. Nobody gave to Jesus a tenth of what He gave to them, yet He lived a supremely glorious, powerful, faithful, and joyous life. In other words, don’t allow what your spouse isn’t to define what you become. Yes, in one sense this is an act of “spiritual self-defense.” But when a spouse sins in a way that doesn’t rise to the cause of divorce, and traditional methods haven’t worked, what else is a spouse to do? There may be a time, further down the road, when you can re-engage with this issue. But when you know it’s time to just accept it for the time-being, these three steps will keep you on track spiritually and even help you to grow in love rather than collapse in bitterness. Posted in Uncategorized and tagged attitudes, Christian, Marriage, Pride, Selfishness. Bookmark the permalink.